Ilan Rubin stopped by Apogee Studios before heading out on the current Nine Inch Nails tour to demonstrate how to record a full song with Apogee Duet, a Mac Book Pro, Logic Pro X and a few simple microphones. His amazing Q drum set (made out of copper) was recorded with only two microphones… a single Royer 121 as an overhead, and AKG D112 on kick. The guitar was recorded with a Shure SM57 in front of a custom built “Kaliphoria Music” amp. Bass was straight into Duet’s instrument input. Vocals recorded with a Shure SM7. 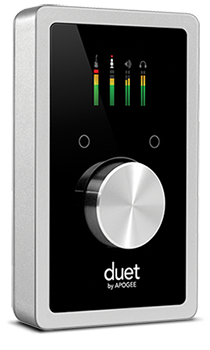 Only Duet’s mic pre amps were used. Ilan recorded the drums first, and then played each instrument one by one, recorded vocals, and then had an amazing song in about an hour. By the way… all the parts were done in one take, no comping, doing multiple takes, samples, or crazy tricks of any kind. Aaron Rubin (Ilan’s brother) then took the 11 tracks recorded in Logic Pro X and sent us back a great mix. Yep.. the whole family is talented.